Jesus said to her, “I am the resurrection and the life. Whoever believes in me, though he die, yet shall he live. 1. Easter is the celebration of the resurrection of Jesus Christ in the Christian religion. 2. Americans spend $1.9 billion on Easter candy. That’s the second biggest candy holiday after Halloween. 3. 70% of Easter candy purchased is chocolate. 4. 76% of Americans think the ears of a chocolate bunny should be the first to be eaten. 6. Egg dyes were once made out of natural items such as onion peels, tree bark, flower petals, and juices. 7. There’s much debate about the practice of dyeing chicks. Many hatcheries no longer participate, but others say that it isn’t dangerous to the chick’s health because the dye only lasts until the chicks shed their fluff and grow their feathers. 8. The first story of a rabbit (later named the “Easter Bunny”) hiding eggs in a garden was published in 1680. 9. Easter takes place on a Sunday, after the 40-day period called Lent. Lent is referred to as a time of fasting, but participants focus more on giving up one significant indulgence. 10. Holy Week is the celebrated during the week leading up to Easter. It begins on Palm Sunday, continues on to Maundy Thursday, Good Friday, and then finally, Easter Sunday. 11. “The White House Easter Egg Roll” event has been celebrated by the President of the United States and their families since 1878. With all the fun things of Easter we need to remember what Easter is really about. 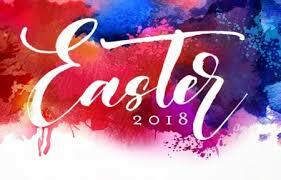 We celebrate Easter to remember the great sacrifice that Jesus made for us in order to save us from the sins we commit so we can go to heaven. More importantly Easter Sunday helps us to remember that Jesus came back from the dead. Although he is not physically among us, He is still present in our hearts. As we get ready to celebrate Easter tomorrow take the time to be thankful for what our Lord did for us. Dear Lord, we thank You for dying on the cross for our sins and then raising from the dead to conquer death so that we may live forever with You. In the Name of Jesus, Amen.